If you’ve been following the webcams, you may have noticed that the SIP installation was completed last week. Construction wrap and temporary doors were put up to protect the house from the elements while the team takes a much deserved Spring Break. Work will resume upon our return to the S&T campus. The first day of SIP installation went pretty well. Nothing went wrong except for at the very beginning. Thermocore was unloading the panels when all of the sudden the boom truck transferring the panels to the ground almost tipped over. Thankfully no one was injured and no damage was done to the panels. We also got our hinges, but unfortunately they were not what we had specified. Hopefully we can get that situated so that we can install them into the roof. SIPS are to go up! SIPS are go be installed tomorrow, Tuesday March 17th. Installation should begin at 8am and continue for most of the day. Stay tuned for updates! Don’t forget to watch the installation live via our webcams! As you may have seen on the webcams there are no walls out at the construction site. We were out at Dark:30 today getting ready for Thermocore’s arrival. At 7:50am, Luke Sudkamp, Director of Design & Construction called Thermocore to find an estimated time of arrival. As it turns out the walls weren’t manufactured as they should have been. View imageFor those of you who have been keeping an eye on the webcams, the subfloor was finished late last night. Thermocore of Missouri will be in Rolla first thing Monday morning to begin putting up the SIP walls. 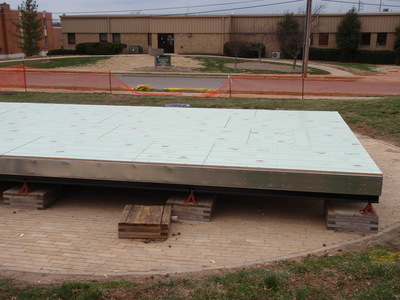 We received the steel for the subfloor this past Monday. All 32 joists were finished yesterday. Here is our construction schedule for the next few days. Relax! Do all the homework we have been procrastinating!